Just like that favorite family recipe with all of the right ingredients, there is a recipe for success for Treats & Sweets Day! Make sure you measure up! Set a fundrasing goal right from the start and get the dough rolling by making a personal donation. Your friends and family will feel inspired to give once they see you have put your money where your oven mitt is. There is no such thing as too many cooks in the kitchen when it comes to Treats & Sweets Day. Just remember to ask! 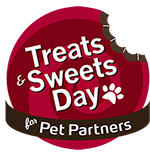 Find friends to join your bake team, tell your colleagues to stop by your Treats & Sweets Day table at work, ask family members to make an online donation, and tell folks your personal story of why you are supporting Pet Partners. Add your own secret ingredient! What makes your story special? Pawsonalize your fundraising page with your own stories and photos. If you are now or have even been a Pet Partners handler, share your story. If you have a family member or loved one who has personally benefited from a healing therapy animal visit, share the touching details. Personalize your Treats & Sweets Day page with photos and messages. Let everyone know why you’re baking and raising funds for Pet Partners – your supporters are more likely to donate if they can understand your story and why supporting animal-assisted therapy is important to you. Maybe you are participating because you are a handler, you recently retired your animal, or because you or a loved one has been a recipient of visit from a therapy animal team during a timeof need. Send personalized emails to potential supporters to improve your fundraising success! Make a goal to send at least 15 personalized emails inviting your friends and family to support Treats & Sweets. Make sure to set a fundraising goal on your page. Setting goals will keep you focused and motivated to rise to be a "whisk" taker. Don't forget to check out the Fundraising Guide for additional ideas. Cookies & Coffee- Be a smart cookie and host a workplace party with perks! Help your coworkers get the morning off to a great start with your grandma’s world famous chocolate chip cookies and a cup of hot coffee. Yappy Hour- Host a pet-friendly happy hour with your closest human and animal pals. Serve homemade doggy treats for the animal guests in addition to all of the yummy people-pleasing treats. Muffin Monday- It is all or muffin! Who doesn’t love a blueberry muffin on a Monday morning? Corks & Cupcakes- Pair some tasty cupcakes with wine or bubbly for your most generous Treats & Sweets Day donors. Are you more of a beer person? Then just go with a Brownies & Brews theme! You can form a bake team for Treats & Sweets Day. Form a company team, school team, Community Partner team, or a team for any type of group you are associated with. Do you have friends who can't bake but want to help? Encourage them to sign up to be on your team and collect donations online. They can also help by spreading the word, helping to package treats, creating eye catching signage, and explaining the work of Pet Partners to your customers. Spread the word! Be sure to forward your individual and team fundraising pages to everyone you know. Utilize the social media images we have provided and share what you are cooking up on Facebook, Instagram, and Twitter. Put posters up at your workplace or school to advertise when and where your Treats & Sweets sale will be held. Do whatever you can to spread the wordabout #Treats&SweetsDay. You may be wondering how to price your bake sale items. Most folks charge about $2 for larger treats such as cupcakes or rice crispy treats. Bakers have often found that just requesting a donation without specifying an amount results in more fundraising success. A person who is passionate about the human-animal bond may be willing to make a $20 donation for one slice of apple pie because they believe in the cause and want to support in a generous way. At your online bakery, you could sweeten the deal by offering a custom tray of hand delivered treats to anyone who donates at least $50. Come up with a pricing and donation structure that works for you. Use our printable price tags and treat toppers for a perfect finishing touch. Maybe you and your pet are a registered Pet Partners team, or you are a proud parent to a brand new pup, or you just REALLY love your llama. Whatever special animals are in your life, involve them by baking up their favorite homemade treats for your Treats & Sweets Day celebration, or by sharing how you are working together to enrich lives by being a part of the Pet Partners Therapy Animal Program.